A nutty inventor and his more clever dog have an adventure on the moon and foil the schemes of a crooked penguin and a sheep lady. Charm. That’s the single word that comes to mind when I think of Nick Park’s Wallace & Gromit. Park is an integral part of Aardman Animation, the studio responsible for Dreamworks’ 2000 release Chicken Run; and it was largely Wallace & Gromit that inspired Dreamworks to sign up Aardman to a distribution deal in the first place. They obviously were charmed as well by the adventures of an inventor and his dog. The two characters had been making appearances of sorts in Park’s sketchbooks for years, and their first story came out of an idea he had for a children’s book. Wallace is a somewhat dim and eccentric British inventor, whose success is due more to enthusiasm than expertise. His dog Gromit is actually the cleverer of the two, despite the fact that he never utters a word. You can see this by watching their eyes. 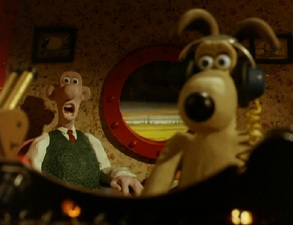 Although both characters can be extremely expressive, Wallace’s eyes maintain a somewhat vacant look, while Gromit always appears to be thinking about something. Gromit’s reactions to events are also consistently more reasoned and insightful than Wallace’s. The irony inherent in this master-dog relationship is one of the pleasures of watching their films. 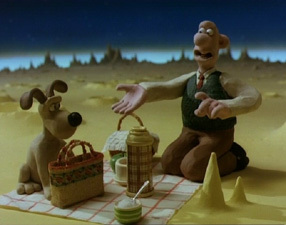 Wallace & Gromit are animated in the stop-motion manner, similar to that seen in King Kong, Jason And The Argonauts, or The Nightmare Before Christmas. Each character has a jointed skeleton, or armature, that allows them to be posed in a great variety of positions. In the case of the Wallace & Gromit films, the armatures are covered by simple Plasticine, which provides the external appearance of the characters. These doll-like miniatures measure about nine inches for humans, and half that for Gromit. These figures are placed into realistic, miniature sets and photographed on film one frame at a time. Of their original three theatrical shorts, each one was at least nominated for an Academy award— the latter two won (the other lost to another Aardman film). 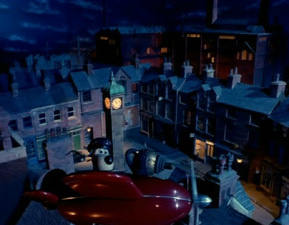 The duo were brought to Aardman by Park, who started the pair’s first film while attending the National Film and Television School in the United Kingdom. A Grand Day Out was actually begun in 1982, but production delays forced Park to make a deal to complete his graduation project while he started part-time with Aardman. A Grand Day Out would not be released until 1989. Once the film was completed, it would be apparent to all why Park had labored so long on the film. It was a work of gentle genius, featuring characters that felt like old friends, having a fantastic adventure in a surreally mundane way. In this case, mundane does not mean boring; it means is that Wallace and Gromit are completely accepting of the plot and their role in it, despite the science fiction and fantasy elements of the story. Extremely successful sequels in 1993 and 1995 followed, creating a pop culture phenomenon that has swept through much of the world. Each film has six to eight chapter stops of its own, and runs approximately half and hour. There is almost no point in describing the plots of these films for two reasons: One, they are deceptively simple and can even sound cliché-ish so as to risk turning you off of seeing them; and two, to go into greater detail in order to go past beyond the simple descriptions could ruin the surprises that you have waiting for you. Nevertheless, I will provide some information as to the general nature of each film. A Grand Day Out introduces us to Wallace & Gromit, but it feels like we have known them for years. Even in their first film, they already seem iconic. The big story point here is a trip to the moon in order to replenish their supply of cheese. Highlights include the delightful construction of their ship in their basement, and meeting a surprising moon resident. This film is not quite as zippy as the others, being slightly more quiet in comparison. You only feel that way, however, if you have already seen the two more polished ones first. On its own, this one is still a real treat to watch. The Wrong Trousers finds our heroes strapped for cash, and Wallace decides that they should take in a border. This all occurs as we are introduced to several wonderful inventions in the Wallace & Gromit household. Colliding plot points make for a terrific tale, as we discover what is unique about Gromit’s new birthday trousers and have our worst suspicions confirmed about their new houseguest. 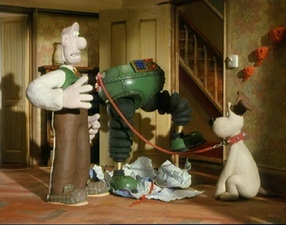 The sight gags become more frequent and cleverer, and Wallace & Gromit seem to go from cult favorites to movie stars. A tour de force chase scene involving a toy train makes this film especially memorable. A Close Shave sees Wallace & Gromit taking on a new career as window washers, since like Donald Duck they tend to enjoy trying out a new job for every new adventure. Wallace finds love as the duo becomes caught in the middle of a sheep-rustling scheme. Gromit is even framed for the crime, and they both take turns rescuing each other from the real villain. The highlight for me here is Gromit’s Snoopy-like piloting of a flying apparatus. Thunderbirds fans will also enjoy a musical reference to that series as Wallace uses a ridiculously complex means to get onto his motorcycle. A trip to the moon, foiling a crook, and stopping a frame-up are the simplest descriptions of what happens in these three stories, but that is just the barest of descriptions. What makes these tales supremely entertaining is a combination of many things. The characters themselves are delightful, with many comic potentialities in the idea of an inventor and his smarter dog. From there, we go to writing. The scripting is sublimely British, complete with the dry humor and quirkiness you might expect. The characters are so well developed right off the bat, that we feel they are old friends. They not only have personalities, they have quirks, which adds much more to a personality description than something like “he’s the brave, smart one, and he’s the clueless dumb one”. Finally, we get to the big one: execution. At every step of these productions, ingenuity and creativity are the most important ingredients. Some of the most impressive technical moments are when we are shown fire or rain. I mean, how do they do that with stop motion animation?? The effect is just plain cool. When asked about special effects in his films, Nick Park likes to say that the whole film is a special effect. That is true not only visually, where double exposures are as fancy as the techniques get, but also for everything else. The set design is incredibly detailed, and it is hard to believe that these sets are only miniatures. A tremendous amount of thought obviously goes into every aspect of designing this world, which truly brings it to life. 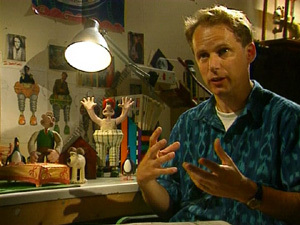 In a sense, Nick Park has taken over from Gerry Anderson in showing three-dimensional miniature worlds that have a deep sense of verisimilitude. 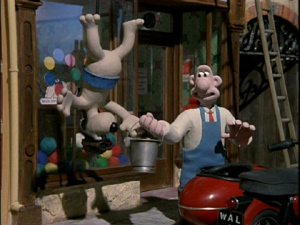 The comedic nature of the Wallace and Gromit films also lends itself to the implementation of many sight gags, encouraging the viewer to pay attention to every detail. Aiding the reality of their world is the lighting used. Park and his creative staff do not shy away from using extremely theatrical lighting, in a manner of sophistication worthy of a Hitchcock film; this is fitting, as they use lighting to create suspense and mystery in a similar manner to Hitch. The lighting does not just vary impressively in harshness, but also in color. The music is used in a similarly effective way, often creating a contrast between the silly-looking characters and a melodramatic score. Still, the creators do not forget that they are creating a cartoon, and the composer is allowed to get silly at times with the music, such as when the penguin in The Wrong Trousers keeps playing peppy organ music in his room. The animation itself is also masterful, showing that “personality animation” isn’t just a product of pencils or computers. The Aardman animators are masters of personality as well as technique. Witness Gromit, whose inner emotions are expressed entirely by the movement of his eyebrows. While personality animation gives the emotional payoff, it is often the other little touches that can truly impress the viewer and bring big laughs. A good example would be how Wallace’s ears flap when he moves, as well as various idiosyncratic movements that occur to make the characters seem so natural. One will notice that the animation techniques get more expert over the course of the three films, as the Plasticine comes to remain more rounded and less squashed, and the animation itself becomes more fluid. Park actually likes the slightly cruder look of A Grand Day Out, and I have to agree that it has a character that is not as evident in the more polished episodes. Overall, though, the sleekness of A Close Shave helps to make it my personal favorite. 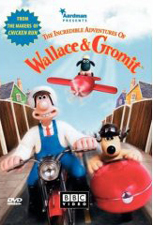 There was an earlier DVD of the Wallace & Gromit films available from 20th Century Fox, with a humble but nice smattering of extras. Ignore that release. There was also a disc released by Universal in conjunction with the Aardman/DreamWorks Wallace & Gromit: The Curse Of The Were Rabbit movie. That disc was better, and included a number of shorter films too, but it is the BBC/Warner release that really poured on the extras— complete with all the features you would expect from a special edition. This puppy comes loaded. The first item to play is a one-minute introduction by Nick Park, which is not accessible by the main menu. From the Extras menu, the first item is Scrapbook, which leads to three features. First up is a set of seven BBC2 interstitials used for station identification; each one has all-new animation of Wallace & Gromit. (Note that the Fox disc had two more interstitials, but they were practically identical to others already included, so the Warner disc simply omits those.) A photo gallery then has stills from the three films, as well as production drawings. The last feature in this section is a set of Blueprints Of Inventions. Moving down the Extras menu, we have At Home With Aardman, which also leads to three areas. The Amazing World Of Wallace & Gromit is an informative, 15-minute behind-the scenes featurette that looks at the history of the films as well as how they have become pop culture phenomena. Next we get six biographies of the creators and producers of the Wallace & Gromit films. Finally, we get a text history of the studio. The next bonus area includes Storyboards of the films. Behind the Scenes is loaded with coolness, as we get eight-minute behind-the-scenes featurettes for each of the last two films, plus video of Park’s early works (including screen tests for Wallace & Gromit). The penultimate extra feature is the Commentary tracks, which can also be selected from the Languages menu. Many fans believe that audio commentaries are absolutely required for special edition DVD’s, and these commentaries by Nick Park and his team show why. They are filled with wonderful explanations of the creative process that went into each scene, as well as pointing out inside jokes and small details you may have missed. Finally, we have a Robbie The Reindeer Trailer, putting the spotlight on another, more recent Aardman film. In a nice design touch, each menu for the five big areas (the three short films, Special Features, and Languages) is accessible from each other at the bottom of the screen. This acts as a main menu by itself, so you will not see a “main menu “ link from the five main areas. Deeper menus, however, will give you a Main Menu option. Here’s a different type of bonus: Although this is a Warner Brothers release, they did not use the dreaded snapper case that was their practice at the time. Licenser BBC Video apparently preferred for Warners to use a white Amaray case. A couple of advertising inserts were included in this release. The shorts are presented in what is apparently their original 4:3 aspect ratio, as they were largely made with television exhibition in mind. The image is crystal clear, allowing the viewer to see every impression made in the Plasticine by the animators’ fingers. A Grand Day Out is a tiny bit grainy, but that is only if one gets very picky. Quality improves over the course of the three films, until we see that A Close Shave looks fantastic. Colors are vibrant but do not bleed. The contrast is wonderful, especially considering the effective use of lighting in these films. The audio is offered in English, Spanish or French tracks, all in 2.0. They sound at least as good as one can expect, with no major faults. For 2.0 mixes, they actually deliver a good bit of liveliness. These characters have reached a huge level of popularity around the world, especially in their native England. Their adventures have mass appeal, as they are filled with creativity and charm. Their success led to a series of ten shorter films, collectively known as Wallace & Gromit’s Crackling Contraptions, available on DVD now in the most recent release of their classic three films. 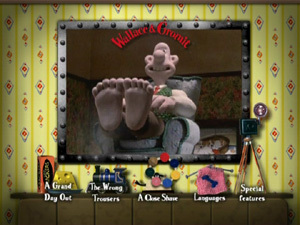 For my money, though, the best release for Wallace & Gromit is this terrific BBC/Warner DVD. 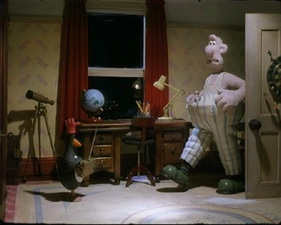 Even if you didn’t care for Chicken Run, it is almost impossible to not love Wallace & Gromit. I cannot imagine an animation collection without this fine disc.